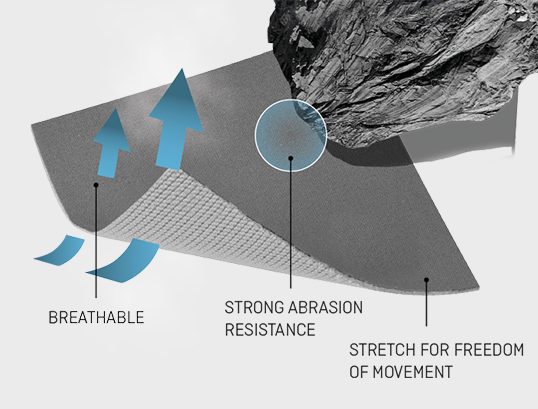 DURASTRETCH is our proprietary abrasion-resistant fabric. We use it to make our hard-wearing jackets and gilets, pants and shorts, reinforcing knee and side inserts and gloves for alpine climbing, trekking and hiking. It’s also lightweight and surprisingly comfortable. DURASTRETCH fabrics are constructed of nylon (polyamide) with a high stretch content. They are lightweight, comfortable yet hardwearing and highly abrasion-resistant. DURASTRETCH is available in a wide range of 2-way stretch and 4-way stretch versions. It is breathable and can treated with a DWR finish to make it water-repellent. Most of the DURASTRETCH fabrics we use in this collection are suitable for four-season use as their inner structure quickly wicks sweat away. DURASTRETCH fabrics make high-quality mountaineering apparel. This version of our DURASTRETCH fabric is engineered with CORDURA® fiber technology and features prominently in our SS18 collection. It has an exceptional strength-to-weight ratio and gives a lightweight and versatile fabric with enhanced abrasion resistance without requiring patches or other fabrics. This also means fewer seams and greater wear comfort. The CORDURA® fiber technology is woven into the fabric to provide increased durability and abrasion-resistance at critical wear points. The fabric is 2-way stretch thanks to the combination of PA and EA. In addition, DURASTRETCH ENGINEERED ECO DWR is PFC free.